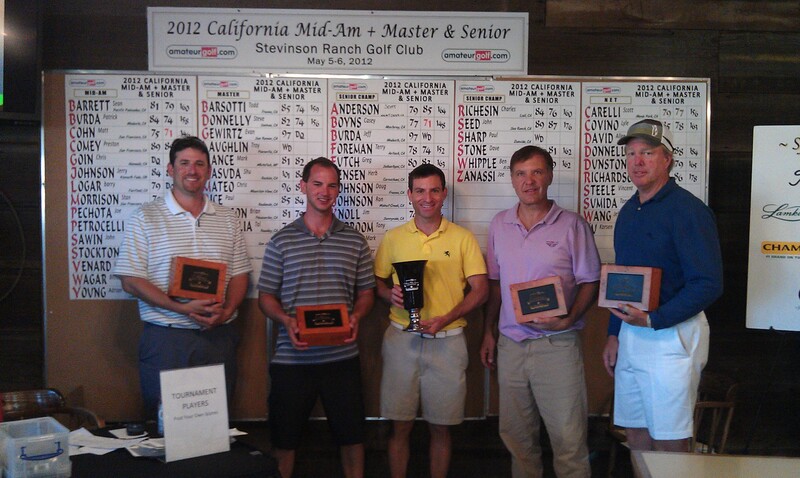 On another blustery day at Stevenson Ranch, the outcome was quite nice for Matt Cohn who played a rock solid round of golf to take the title by 5 shots. He whipped me by 8 today, and deserved to win!! Honestly after a day like today, I not only laugh at the thought of trying to play professionally, I even question my ability to compete in the amateur ranks. I guess that’s perhaps how you should feel after a 2012 worse round of 79. And it was real simple, I hit it bad, chipped it bad, and putted poorly. So I’ll have tonight to be pissed off, and tomorrow to start fixing the problems, as Spyglass awaits me on Fri-Sun with partner Darryl Donovan for the NCGA Two Man Championship. Stevenson Ranch is a good test of golf with the wind up, shots not squarely hit will go in some really bad places (very high grass) and if your speed is off on the greens, it will punish you there as well. On the Senior side legendary Casey Boyns had the only other round under par with a fine 71 of his own. Coming up next- 3 days with Dustin Johnson at the Olympic Club……question is can he out drive me…? My guess is YES and by a LOT!! I’ll have video footage of that experience and fun stories coming up next!! STAY TUNED- AND IF THIS BLOG HAS DIMINISHED IN YOUR MIND, THEN TELL ME…..I”LL BE CRANKING IT UP HERE THROUGH THE US OPEN AND SENIOR OPEN!